At the Eastern Virginia Family & Cosmetic Dentistry, we focus on providing tooth replacement solutions that simulate natural tooth structure, function, and aesthetics. Using state-of-the-art dental implants and custom-designed full arch restorations our cosmetic dentists create implant-anchored dentures that can enable patients to once again chew, speak, and smile with confidence. These innovative dentures are designed to lock into place, which helps them feel and function more like natural teeth. Whether patients are replacing missing or damaged teeth for the first time, or looking to upgrade from traditional dentures, implant-retained dentures can be an excellent long-term option. Although traditional dentures may serve as an effective method of replacing missing teeth, implant dentures can offer a more comfortable, convenient, and cosmetically pleasing solution. Implant-supported dentures, also referred to as “anchored dentures”, require strategically placed dental implants to secure the full arch(es) in place. Designed to restore proper dental function, improve bite stability, and create a natural-looking smile, implant-supported dentures can be an excellent option for patients who want to replace all of their upper and/or lower teeth. Traditional dentures can be associated with a number of inconveniences. The pastes and adhesives used to hold traditional dentures in place can be bothersome and unreliable. Ill-fitting dentures may also be prone to slipping along the gums, which can cause difficulty eating or speaking, and be uncomfortable and embarrassing. Implant-supported dentures have also been shown to reduce gingival irritation and jawbone loss when compared to traditional dentures. Implant-retained dentures may also present a good alternative for patients who are not ideal candidates for a full set of single-crown dental implants. The term “anchored denture” refers to any denture that is secured with dental implants. 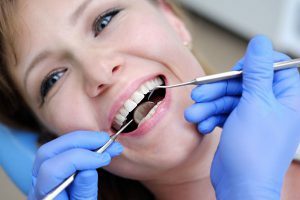 There are several different treatment approaches our dentists can customize to meet the unique needs and goals of each patient. The right technique depends upon factors such as jawbone density, personal preferences, and budget. The All-on-4® technique uses four dental implants per arch to secure the denture in place. Two implants are placed on either side of the front of the mouth and two additional implants are angled posteriorly to create a comfortable, stable fit. “All-on-6” is a technique similar to All-on-4® that uses six dental implants per arch rather than four. The All-on-6 technique provides additional stability and may be used for patients who have diminished jawbone density. Full mouth restoration with implant-supported dentures refers to cases in which a patient desires implant-supported dentures to replace all of the upper and lower teeth, creating a beautiful new smile. During the consultation process, your dentist will perform an oral exam, review your medical history, and help you decide which full-arch dental implant option can best meet your needs. Each implant denture procedure is custom-tailored to achieve natural-looking aesthetics and a comfortable fit. The titanium dental implant posts are placed in the jawbone according to the pre-determined surgical plan. In some cases a temporary denture can be attached while the implants heal. Once the dental implants become healed and integrated with the bone, the final denture restoration can be secured. The dental implant surgery can be performed using sedation techniques to relax patients during treatment. The procedure can often be completed in one office visit. At the end of your initial consultation, your dentist can provide you with a price quote for the procedure. For qualifying patients who could benefit from low monthly payments and low interest rates, we offer a number of flexible dental financing options. If you have questions about implant dentures, we encourage you to contact our office to schedule a consultation.